Preface: Cisco has announcement yesterday that there are vulnerabilities found on IP Phone 8800 Series. About IP Phone 8800 Series: The Cisco IP Phone 8800 Series delivers HD video and VoIP communications, and integrates with your mobile device to meet your business needs. 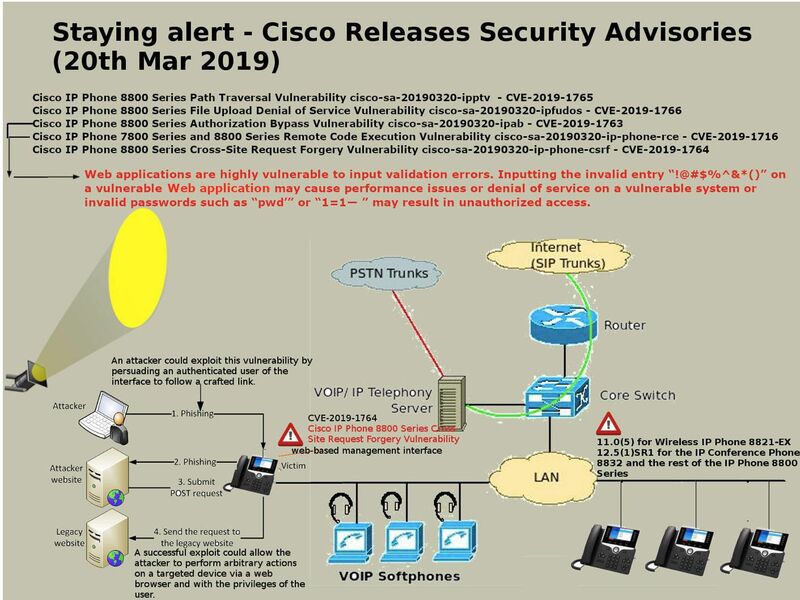 Synopsis of 2 items of vulnerability: Perhaps Cisco did not provides the vulnerability details on CVE-2019-1716 and CVE-2019-1763. However there are hints let’s we can speculate those issues. Web applications are highly vulnerable to input validation errors. Inputting the invalid entry “! @#$%^&*()” on a vulnerable web application may cause performance issues or denial of service on a vulnerable system or invalid passwords such as “pwd’” or “1=1— ” may result in unauthorized access.